You may know Local Motors as the company behind the Rally Fighter, but these days, it's best known for creating the world's first 3D-printed car. As the company prepares to sell those cars to the public for the first time, it's come up with an unusual proposition for potential customers. From time to time, it wants to melt down their cars. Though details of its program are not yet precise, Local Motors wants to offer customers the chance to upgrade their cars throughout the duration of ownership. At a traditional automaker, that'd mean trading in one car in exchange for a newer one. But because their vehicles are made of plastic, Local Motors wants to elevate the idea of recycling to a new dimension. As if the novelty of owning a 3D-printed car isn't enough, the company wants to melt down an old vehicle, then, from the remaining puddle of thermoplastic and carbon fiber, use that material to print a new car with the latest and greatest features. A certain number of these hardware upgrades would be available to customers, depending on the particular terms of their contract. "We're working on that process as we speak, and it's possible because that material is recyclable," said Justin Fishkin, chief strategy officer at Local Motors, tells Autoblog. "People might actually want to keep their car longer, or they'll say, I want to bring it back and we'll have a better car by the end of the day.'" 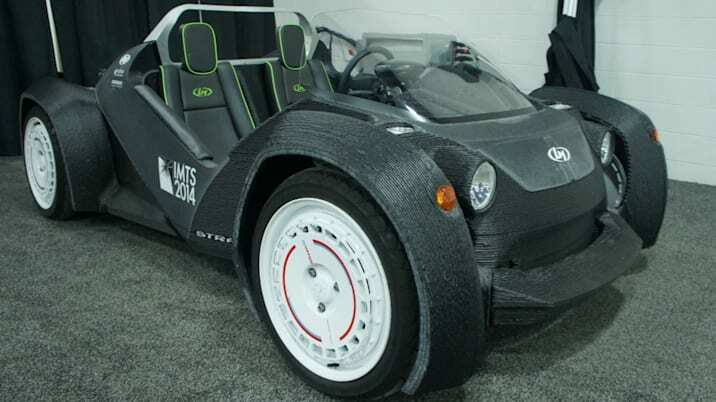 Local Motors captured the imagination of innovators and onlookers by 3D-printing a vehicle, the Strati (pictured below), in 44 hours at the Detroit Auto Show. Now it's getting closer to 3D-printing electric cars for customers. Last week, it announced plans to start taking orders for its new "Swim" model, pictured above, an updated iteration of its vehicle, in the spring of 2016. Delivery is tentatively slated for late 2016. The company says MSRP for the vehicles will start at $53,000, though Fishkin says that could vary from $18,000 to $60,000 depending on options chosen and the frequency of upgraded hardware. "That's for an upgradable hardware experience, and might be for multiple cars," said Fishkin, explaining that price may pay for something that looks starkly different than a traditional ownership model. "The best proxy is the phone, and you have a two-year contract and you can upgrade your phone. It won't look exactly like that, but it will look similar." It's a novel approach similar to what Tesla Motors has done with upgraded software. Last month, Tesla Motors sent over-the-air software updates to thousands of cars, instantly transforming ordinary vehicles into ones capable of semi-autonomous operations. It was a remarkable feat, and the most audacious example yet of how the promise of upgraded software throughout a car's lifecycle could upend the auto industry. Attempting a parallel approach with upgradable hardware might be bolder. "In automotive, for about 100 years, we've been doing things incrementally better on a fundamentally similar platform," Fishkin said during remarks Tuesday at the Connected Car Expo held at the Los Angles Auto Show. "We need to increase the pace of that development." Printing cars and components has allowed Arizona-based Local Motors to accelerate its development, in particular with crash testing. It might take a traditional automaker weeks or longer to decipher crash-test results and make structural changes to a car, but Local Motors engineers can redesign a component, print it and re-test it "in a matter of hours or days instead of months or years," Fishkin said. That process will only become more important as the company seeks to pass federal safety standards and receive necessary certifications to begin selling vehicles. It expects to begin selling vehicles that fall within a low-speed category first, but as it ramps up production of new iterations beyond the one introduced in Las Vegas last week, it intends to also produce "high speed" vehicles fully capable of highway driving. (Based on the upgradeable hardware concept, it's possible a customer might initially buy a low-speed car and upgrade to a high-speed one once they're ready). Local Motors intends to start production at a new facility slated to open in Knoxville, Tennessee. New "microfactories" are planned for Washington D.C. and Detroit. Each facility could produce approximately 2,400 cars per year. From there, the company has its eyes set on an international expansion, starting with a facility in Berlin and future locations eyed in Singapore and South Korea. Right now, the company can print a car in about 40 hours, about four fewer than its initial printing times last year. Local Motors has set a goal of whittling that process down to 12 hours. "We're finding that if you slow the printer down in certain spots, it's actually laying it down better, and then that speeds up other parts," Fishkin said. "It's simple things and we're stumbling upon discoveries every day. We're explorers right now, and we're getting more efficient."